Nineteen Sixty-Three was a great year for Italian cinema, among others the year brought us Fellini’s 8 ½ and Luchino Visconti’s The Leopard. Arguably on par with these two pictures, though much lesser known, is Mario Monicelli’s The Organizer, a superlative, visually stunning, period labour film featuring a bearded Marcello Mastroianni as a beleaguered professor who wanders into a small industrial town to incite a labour strike. We can feel the weight of the film instantly. It’s the late 1800s in Turin, Italy, the heart of the European Industrial Revolution, and a power struggle has developed between a hopelessly exploited labour force at odds against a privileged bourgeoisie. Eighteen-hour work days, little pay, poor working conditions and inadequate benefits were the result of early unbridled capitalism. Out of this powder keg of conflict came labour unions, strikes and, ultimately, socialism in Europe. This is the just context for Mario Monicelli, who covers the labour strike of one small Turin community at this time, the fear and trepidation of workers just beginning to organize. 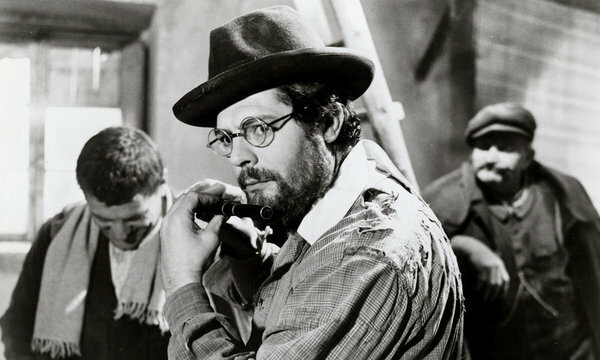 Marcello Mastroianni plays a bearded vagabond professor arriving in town, illegally hitching a ride on a train. Once in town he finds a room with a local worker, and while overhearing talks of a labour strike, he can’t help but intervene and offer advice. What the professor quickly realizes is that the town, while passionate about solidarity, is missing leadership. The professor turns out to be a brilliant orator and rallies the workers in a lengthy strike that tests the internal fortitude of the entire village. It’s not all reverie, as Monicelli takes his characters to task for their decisions. The fight against the factory owners is bloody without the heroic ‘workers of the world unite’ propaganda one might expect from a ‘labour film.’ At the time the movie was billed as a period neo-realist film. Indeed, the use of local non-actors, real locations and distinctly working class themes are prominent, but it’s the dose of cold hard realism at the end that resonates best. However, the reason the film justly sits alongside The Leopard and Fellini’s 8 ½ is the superlative visuals engineered by dynamo DOP Giuseppe Rotunno and the authentic production design of Mario Garbuglia (who also designed The Leopard). Rotunno’s magnificent black and white photography is rich with detail, particularly the scenes in the textile mill, which are a wonder. The wide-angle compositions showing the machines and men working in unison are awe-inspiring, capturing with utmost authenticity the look, sound and feel of the Industrial Revolution. Few films have captured more faithfully the flavour of this period (David Lynch’s The Elephant Man being one exception). The Organizer comes at a time when, arguably, B&W cinematography was at its peak – the '60s - the last decade before colour almost fully took over. Thus, we get to see pristine, immaculately lit, stark imagery in beautiful widescreen, creating a truly epic feel, incomparable in quality to any colour films at the time. Though I have no quantitative evidence to base this on, I don’t think it would be too presumptuous to say it would take another 20 years before colour film stock caught up to the quality of B&W film in the '60s. From technical to creative to historical, The Organizer is a triumph on all levels of filmmaking. The Organizer is available on Blu-ray from The Criterion Collection.